Options: 13 qt. 16 qt. 20 qt. 9 qt. Rugged stainless steel is durable and easy to clean. Seamless and sanitary; rust and scratch resistant. 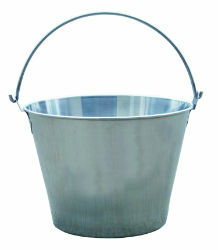 Great for distributing feed and water. Strong wire handle for easy carrying. Ideal for farm and home.